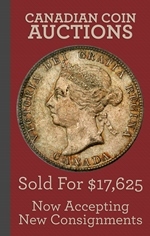 Description: 1887 $2 bills kind of fly under the radar when it comes to Dominion of Canada currency. Each note features the portrait of the Marchioness and the Marquis of Lansdowne. Those aren’t exactly household names today. These were also the only bank notes dated between 1882 and 1897. These aren’t terribly popular, but they can be rare and expensive. Varieties: Our guide shows the standard 1887 $2 bill with no letter below the blue serial number. If there is a black “A” below your serial number then you have a scarcer variety. The A notes are worth about three times more than the more common variety that we have pictured. 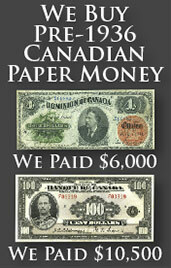 We buy all 1887 $2 bank notes from The Dominion of Canada. Values are based purely on condition and generally range from $400 to $5,000. If you would like our offer, then please send us pictures of your bank note. We will grade the paper money and respond back quickly with our buy and sell price. You might be surprised at how much money some high grade notes or rare varieties can be worth.